Dari is from Lin's second litter. She is a cute and very personable girl, and is showing much talent. I am hoping that she will follow in her mother and grandmother's footstep. 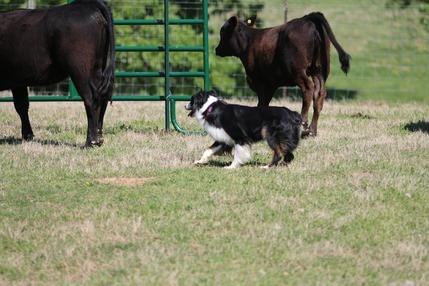 Dari got to compete at her first stock trial, in Ball Ground GA March 8-10. Proud of my cute little girl! 7 runs, 7 Q's and 6 1st places! Plus High scoring started Aussie with a nice cattle run/score! She earned her started sheep, duck and cattle titles, and an open farm trial dog sheep leg! Just because we could, I entered Dari in the AHBA trial in HRDIII (Herding Ranch Dog level 3) on sheep. She qualified both trials. She ended 2012-13 ranked top 10 in all 3 ASCA started stock merits, 1st in sheep, 5th in ducks, and 7th in cattle. She also had a successful 2013 ASCA Nationals, qualifying with a 2nd on open sheep in the pretrial, then qualifying in open cattle with a 3rd and open ducks in Nationals. She also qualified in Agility and Rally, and was an MVA qualifier. Dari finished her WTCH in 2014, with a number of nice runs, many earning finals points. Once again she was an MVA qualifier, with success in all 3 stock, as well as Novice agility and excellent Rally.